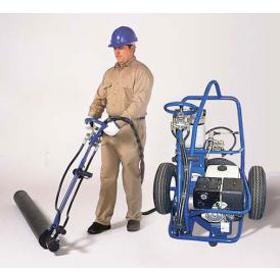 This unit is the original roller screed tool (Bunyan striker from the USA) with its powerfull Honda engine and its strong tubular steel wrap around frame which is the hydraulic oil tank and the drive handle which operates from this via 10 mtrs of reinforced hose connected to the main unit. This also comes with a T bar for the other end of the selected tube. The bunyan striker is an efficient, highly versatile and modern alternative way to "strike off" and finish large floor areas of newly laid concrete. Tubes of varying sizes are fitted to a hydraulically powered drive handle, which in turn, spins the tube over the top of the newly laid surface. The tube rotates in the opposite direction of travel(effectively pulling away from you) creating a positive feel of friction, gathering a build up of up to 100mm of concrete, which flow ahead of the spinning tube. Big blue float 3/4/5 ft wide to float of floor(like big handfloat) and poles@ 2mtrs long each. Frezmo broom to give grip on the finnished concrete. Power floated(helecopter) to a highly smooth floor and therefor pollished. Here are some specs if your interested. Honda 13 hp petrol engine. 10 mtrs of twin hyd hose.